Over the Thanksgiving break Merrilee and I traveled to Italy to be with our daughter Sancianna. Sanci is studying abroad in Italy at Florence University of the Arts, having departed in early August from home as a senior at Saint Mary’s College of California. This trip was a reminder that life is awesome and precious all in one. The trip provided time for visitation, reflection, and renewal. Honestly, one of the take-aways was that life seemingly/silently moves quickly, and is to be lived each day to the fullest extent possible. Perhaps the most sacred and peaceful moment of the trip occurred at the Altar of Saint Joseph a stunning chapel in the Vatican’s Basilica. Honestly, life is so composite, I tend to get absent minded and overwhelmed in places like museums, etc. 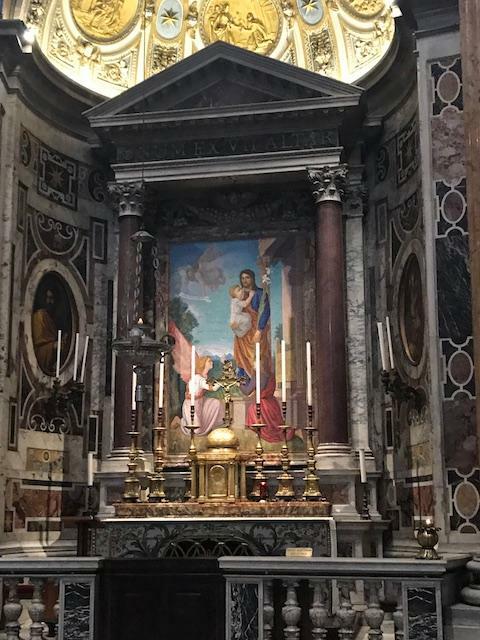 Yet, in this one location, I could not help but fixate on the altar that was dedicated to Saint Joseph and blessed by Pope John XXlII on March 19, 1963. Saint Joseph quiet and strong stature, at the front of the altar with baby Jesus in his arms, reminds me of the importance of father figures in our lives. Yet, it beckons to the mysteries of our faith and the sacredness and loving example of the Holy family . This time of the year retells the beautiful mysteries and aspects of our Holy Mother’s role in God’s beautifully designed plan. Our moms guide us with courage, nurturance, compassion, and tremendous care, too. As we await the “coming” of the baby Jesus, during this Advent season, and as our homes and hearts unpack and become a glow -- may we always remember the innocence/sacredness of family . Let us pray for those who are suffering from illness, loneliness or other challenges. May God keep them in His tender and loving care. 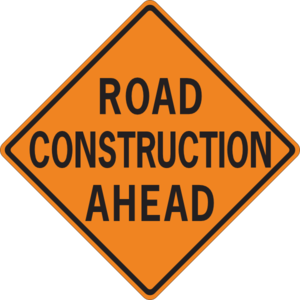 Limited access on Service Road Entrance: Workers will be digging outside the Ministry Center this week so access will be limited on the service road entrance. If you have to come to the school entrance to pick up a sick child and can't get though from Brandon Road, you can enter the large parking lot and drive alongside the gym and in front of the Church to the office. CLUB CTK invites you to make holiday ceramics: All Fired Up Ceramics Studio will be at CLUB on Wednesday, December 5th. Students who enroll in this class will be provided with everything they need to make a Christmas themed ceramic piece. The pieces will be fired and delivered to the students before Christmas break. You will not be charged for CLUB during the time that your child is participating in this class. Please click here for details on how to sign up. If you have additional questions, please contact CLUB at CLUB@ctkschool.org or 925-685-0995. 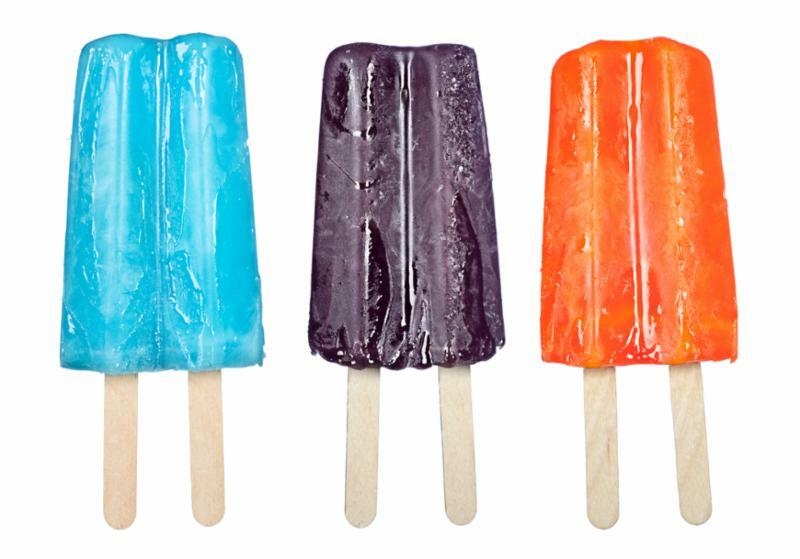 Ice Cream and Popsicles: We are in the process of purchasing a new freezer for Ice Cream and Popsicles. We will be selling ice cream again when we return from Christmas Break in January. Thanks for your patience and we hope you enjoy our Advent Goodies! As you do your holiday baking and hosting, please look for box tops on cereals, Reynolds parchment paper and baking cups, Ziploc bags and containers and Hefty bags and tableware. Happy holiday and Happy Clipping! 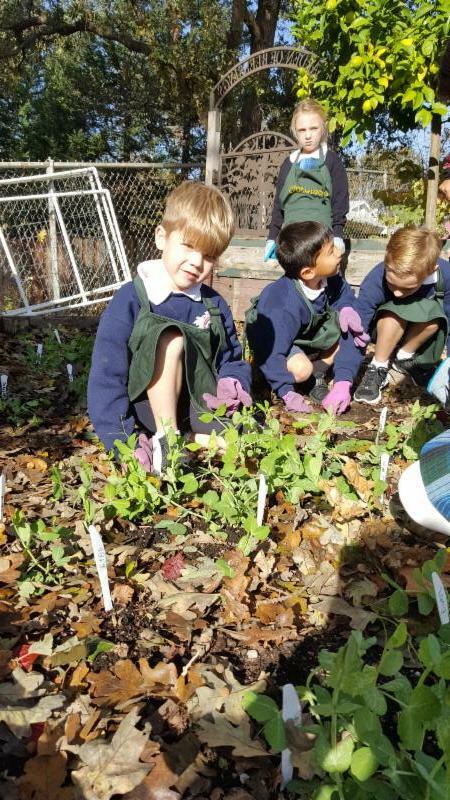 1st Grade learned about carrots and their place in the garden. Carrots are unique because we eat the root (taproot) itself, rather than a fruit or seeds. They labeled the parts of a carrot plant on the garden whiteboard, and then planted rainbow carrots and King Midas carrots. 2nd Grade learned about the three types of soil: sand, and clay. They read "Diary of a Worm" and discussed how tiny animals help keep our Earth healthy. 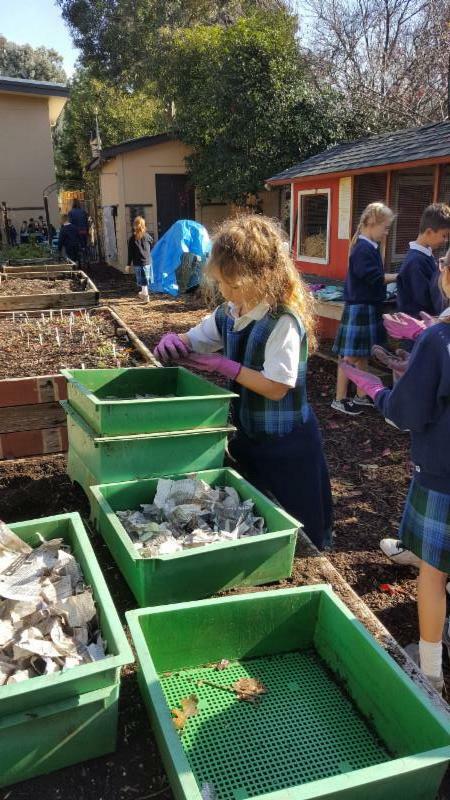 In the garden, they shredded newspaper for bedding in a vermiculture (worm composting) bin. They also put food scraps and one hundred red worms in this bin. Over the next few months, these worms will break down the organic matter and produce worm castings, which will help fertilize the garden. The fifth grade class has been studying exploration and settlement of the United States. 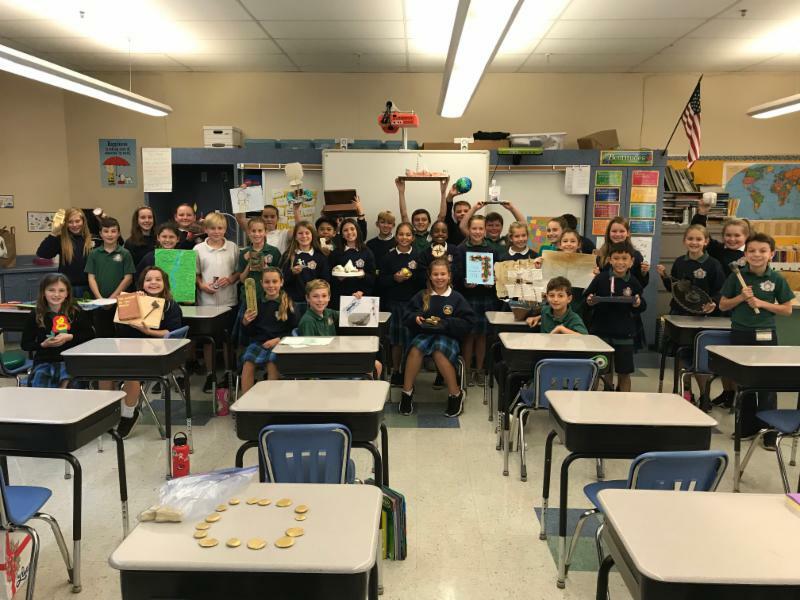 As part of this unit, students worked on an explorer’s project which involved a research paper and the creation of an artifact that represented their particular explorer. They set up a museum so students from other classes could walk through and hear about the different explorers. 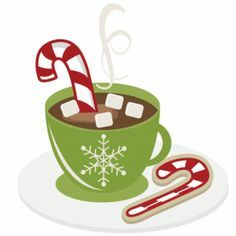 STUDENT LEADERSHIP ADVENT BREAKFAST GOODIES: Student Leadership and parent volunteers will host Advent Breakfast Goodies on Wednesday, December 5 th and December 12 th . Your child may enjoy muffins, donuts, and bagels, plus beverages including hot chocolate and cider all served at 7:30 a.m. by the flagpole. Breakfast goodies range from $1 to $2 per item. Student Leadership members are also making CTK Christmas Bracelets that will be available for $.50 each. Money generated from the Advent Breakfast Goodies will be used to purchase scrip for Saint Vincent de Paul Christmas dinner baskets. St. Vincent de Paul Dinner Baskets: This holiday season, we will continue the longstanding CTK school tradition of collecting food for the parish St. Vincent de Paul Christmas food program. For many years students have gathered food and then helped assemble holiday dinner baskets for many local families less fortunate than ourselves. Please consult the list below for the items you are asked to send to school with your child/children. 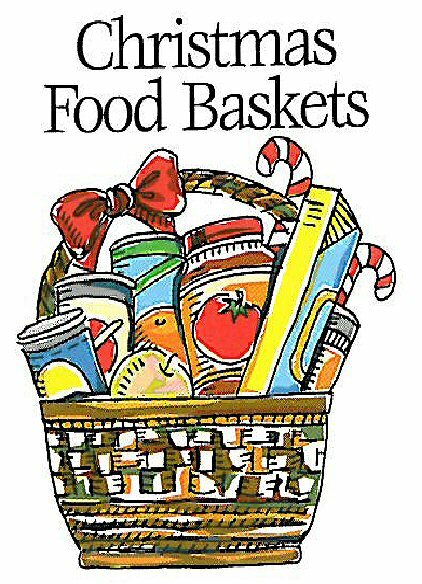 All items are needed by tomorrow, Wednesday, December 5 th so baskets can be assembled on Friday. Many thanks for your generosity! 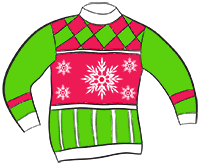 Wear a Christmas Sweater or Sweatshirt and Benefit Paradise Fire Victims: Students may wear a Christmas patterned or colored sweater or sweatshirt and bring $1 on Thursday, December 13th to benefit Paradise Fire Victims. Please follow the Non-Uniform Apparel guidelines in the Parent Student handbook. GIFTS FOR ST. BONIFACE PARISH, SAN FRANCISCO: The San Francisco Police Department will once again be collecting gifts for St. Boniface Parish in San Francisco on Wednesday morning, December 19 th . The SFPD will be on hand with their vehicles at our 8 a.m. morning assembly to load up our gifts for the less fortunate children and adults in the St. Boniface Parish community in the Tenderloin district. Gifts are needed for children of all ages, from newborn to 18. Gifts for adults are also needed and greatly appreciated. Please read the St. Boniface flyer here before purchasing items. Please wrap and label the gifts for man, woman, infant, boy, or girl and include the item type, size, age range. Click here for Gift tags. Possible gifts for children are things your children might enjoy; for adults, socks, gloves, scarves, warm hats or beanies. Thank you for your generosity! For relatives and friends who would like to see our performance but are unable to attend in the evening, we invite you to our dress rehearsal on Tuesday, December 18th at 1:00pm in Church. 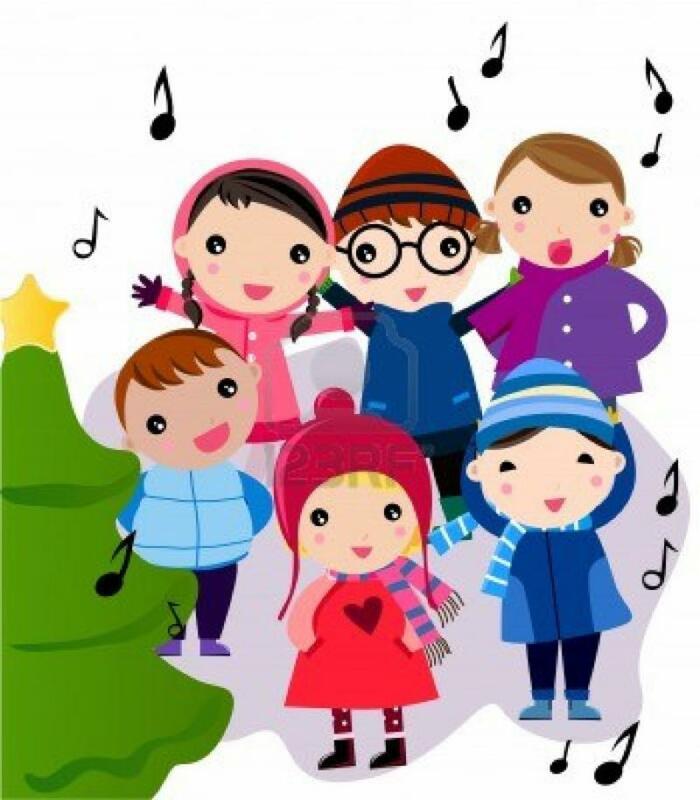 Christ the King School’s annual Christmas Concert performed by all students in Grades K-8 will be held on Tuesday, December 18 th , at 7:00pm in Church. This is a wonderful tradition and we hope you all will join us! Girls: Skirt or Pants- dark black or navy, shirt or dress - jewel tone in deep purple, red, green or blue. 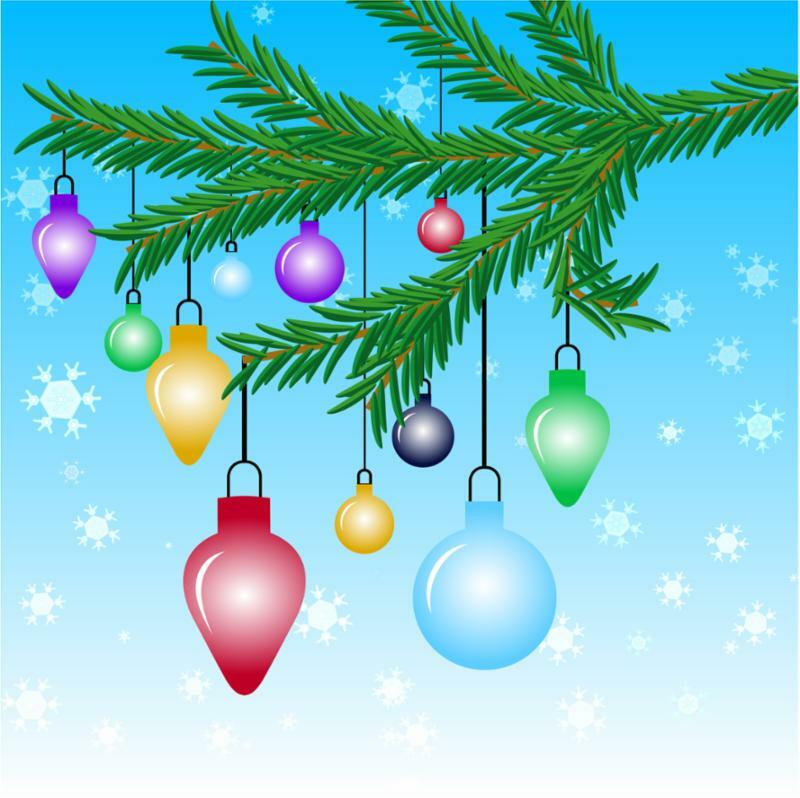 Please follow the guidelines for non uniform apparel in the Parent Student Handbook and, for this festive occasion, no jeans, t-shirts, hats, or playtime attire. An update on regarding the Christmas Eve mass... The Christmas Eve Mass is a GO! I have 13 kids currently signed up. If you are still interested, IT'S NOT TOO LATE! I would still love to get more members! If you are available, please send me an email at rlejano@ctkschool.org . 4:45pm - Meet in the Church choir loft to practice. I must warn you that you'll be fighting a little bit of traffic from people leaving the 3:45 gym mass. That said, once you get past that, you'll have prime seating in the church for the Family Liturgy since y'all will be there so early! 5:30pm - Mass Begins and will be out by 6:30. The song selection will be sent out as I receive emails. Thank you all for your continued support and I hope to see you all there! We are excited to present our first edition of The Crusader Chronicles - CTK's new school newspaper. 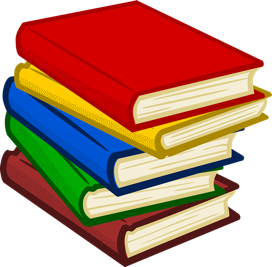 The articles in this first edition were written by students in the fifth grade class. Our Lady of Guadalupe and the Immaculate Conception are two very important events in the Catholic church during the month of December. 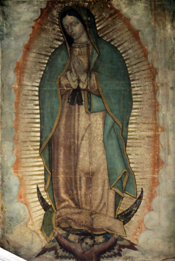 Our Lady of Guadalupe is the name given to the Virgin Mary. She is believed to have appeared in Tepeyac Hills, Mexico City on December 9,1531. She appeared to a peasant named Juan Diego. She told him told him to build a shrine on the spot where she appeared. Juan Diego told the Bishop about Mary’s request, but the bishop didn’t believe him and ordered Diego to show a sign of proof before he would give his approval of the construction.On December 12, Mary appeared to Diego and ordered him to collect roses and put them in his tilmatli which is a type of cloak and or coat. Later, Diego took the roses to the bishop and, when he opened his cloak, dozens of roses came pouring out and revealed an image of our Virgin Mary. 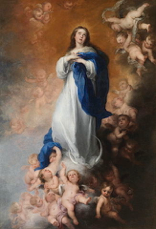 The Immaculate Conception was when our Virgin Mary was freed from “Original Sin”. This let her become “second Eve “and her son Jesus, “second Adam”. They are referred to these names because Adam and Eve were the first humans to walk this earth and were given the privilege of not having original sin. Mary and Jesus were created sinless too, just as Adam and Eve were. This event is celebrated on December 8, which is nine months before September 8, which is her birth date. If you are wondering why The Immaculate Conception feast day is nine months before Mary’s birthday, it is because December 8, is the day that Mary was conceived. Mr. Silveira is CTK’s faithful principal. He is humble, compassionate, and genuine towards students and staff members. He was inspired to become a principal by leaders, pastors, sisters, and colleagues, but what stuck with him the most was their actions. Before CTK, Mr. Silveira was a math teacher at Carondelet High School because of his love for this particular subject. Every principal has plans for the day, but certain attributes go along with them. Early in the morning, Mr. Silveira has prayer with the faculty members and assembly with us students. These activities require gratefulness and trust for God. From then on, he has all different types of meetings like principal, school board, and parish council meetings. These meetings benefit the community, church, and CTK. Along with a pen and paper, Mr. Silveira brings flexibility, responsibility, and listening skills to these gatherings. We know Mr. Silveira as a principal, but most of us don't know him outside of school. Interestingly enough, Mr. Silveira has a fifth generation ranch with black angus cows. He enjoys hiking in Tahoe with his family and all of God’s creation. Mr. Silveira has a family of six made up of three boys and one girl. Sancianna is a senior at Saint Mary’s College, Joseph is a senior at Berean Christian high school, Christien is a sophomore at Berean Christian high school, and Landen who is in 7th grade at CTK. Along with four children, Mr. Silveira also has three dogs, Boomer, Tinker Bell, and Annabelle. He also has a cat named Cooper. Mr. Silveira’s biggest pet peeve is when Mrs. Silveira leaves the lint from the dryer on top of the washing machine and doesn’t put it in the garbage can. Mr. Silveira is an amazing principal because he cares for students and keeps a good balance between school and family. Recently the 8th grade went on a retreat. They played lots of games and had an extraordinary time. They also had meaningful discussions and learned a lot about each other that they did not already know. The day was made possible thanks to everyone who contributed to the retreat. The 8th graders had an amazing time! Mr. Lejano and Ms. Thornbury also helped out a great deal and scheduled lots of fun games for them to play and a delicious pizza lunch. The 8th graders are lucky enough to be going on another retreat in the spring, they are very excited! Ms. Thornbury’s favorite part about being a teacher is that she loves to help people succeed. She also likes to see younger siblings from former classes come into her class all grown up. In her opinion, the most challenging part about being a teacher is trying to fulfill everyone’s needs at the same time. Did you know that Ms. Thornbury went to Christ the King and that her mom is Mrs. Thornbury in the office? Growing up her favorite subjects were ELA and Social Studies. It all started when Mr. Witte came to CTK from University of San Francisco College of Education. He was a technology assistant at UCSF College of Education. Now he is the technology teacher at our school. One of his specialties is helping with the technology in the classrooms. Mr. Witte says technology has improved over the years. Technology has gotten a lot easier to use, and you can do more with one device. On an ipad, you can watch videos, play games, and do research. But earlier in the century, you needed three separate devices to do those three separate things. Mr. Witte has started to teach Kindergarten technology like they are on a field trip. He says to start slow and, by the time they are in the fifth grade, they will learn everything they need to know. Mr. Witte is going to make bigger changes in technology at our school by 2020. But right now, Mr. Witte is thinking about new ways to have technology everywhere in our school. Mr. Witte’s favorite type of candy is Haribo gummy bears and coke bottles. When he was in school, his favorite subjects were science and art. His favorite costume he wore when he was younger, was a Power Ranger from third grade. In his free time, Mr. Witte likes to hang with his family and godson. His godson has tried to get to play video games even though he isn’t very good. 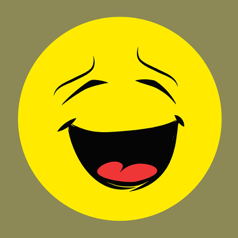 His family consists of his younger sister, his wife and his wife’s sisters. Why were the parents scared of the report card? Was a direct descendent of David. Let's face it... we are all going to be spending money this holiday season. Please support CTK School by using easy online scrip this year! Please visit https://shop.shopwithscrip.com to purchase. Giving gifts to teenagers or others who are impossible to buy for? · Buy gift cards online and you can still get “physical cards” to give as gifts – convenient pick-up in the office or delivered to your child’s classroom every Thursday. · Imagine being able to buy your Target, Starbucks or iTunes cards now and your child's school still benefits. Going to buy items online via Amazon anyway? Why write a check for the full $250 if you don’t have to? 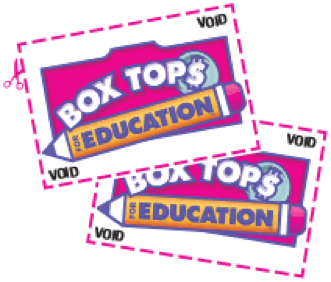 · After you have reached $350, 50% of our purchases will be credited towards your tuition for the following school year. · The fee is only 15 cents no matter the amount you buy. Why do it? Did we mention – It helps the school! A uction Update: The Solid Gold Auction team is hard at work with 81 days until the big event!! D ONATIONS: A s always, the CTK Auction Team is looking for exciting or new items to feature in this year’s silent & live auc tions. The success of our auction is greatly determined by the generosity of our CTK families. Ask your hair stylist, dry cleaner, car wash, nail salon, and other places you may frequent! Do you have a vacation home? 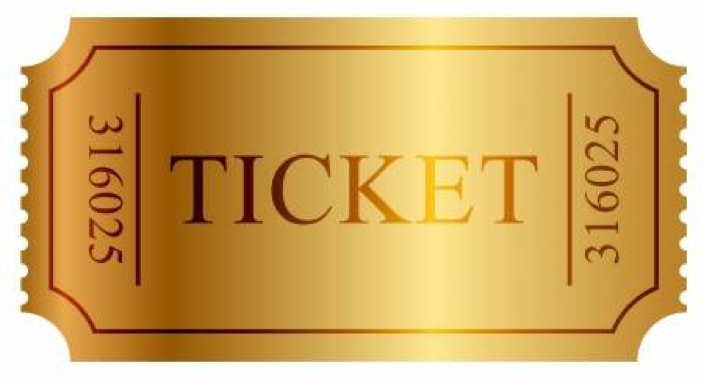 Access to tickets to a sporting event? Theater event? We appreciate ALL you help in procuring donations to make this a successful event! Fill out a form here: Donate to CTK Auction or contact procurement@ctkschool.org with any ideas or questions. SPONSORS: Join us by making a sponsorship donation, enabling Christ the King to do a tremendous amount of good in our community and beyond. In return we will create for you a fantastic opportunity to position your business to a valuable demographic in central Contra Costa County—and you’ll have some fun in the process. Are your kids (or you!) 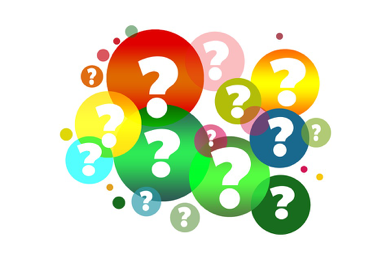 just dying to know the theme for our 2019 Festival? 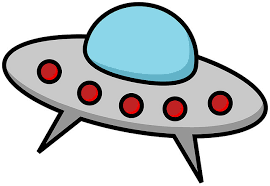 Well the wait is over, the votes have been counted, and your Festival Committee Meeting is pleased to present "Aliens/Space" as our theme for Festival May 17-18, 2018 ! Festival Committee always has a blast making our theme come alive each year, so bring your creativity and enthusiasm and join us at our next Festival Committee Meeting, which will be held next Monday, December 10 from 7:00pm-8:00pm in the Media Center. Click here to view December's P artners in Faith and Home & School Connection . These issues are filled with lots of interesting information. CTK spirit items please ptgpresident@ctkschool.org for information and ordering.